Larry Lauria who I work with at Full Sail told me I had to hear Dan Rafkin play guitar. He let me know that Dan would be [laying in Winter Garden in the Plant Street Gazebo on the evening of March 8th. Dan apparently has very fast fingers and his writes his own songs. 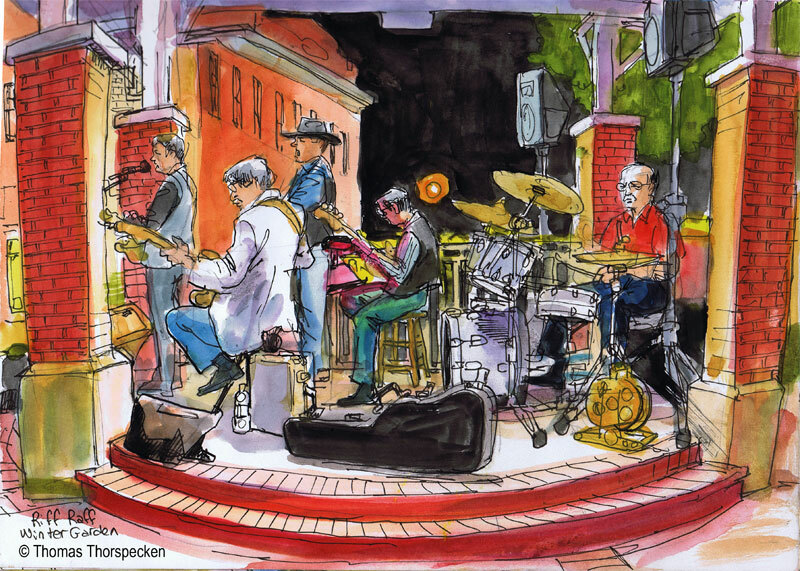 Downtown Winter Garden is a model for how a downtown can be am ideal place to gather. A pack of girl scouts rushed past me as I walked towards the gazebo. So much of Central Florida had developed into tasteless over developed strip malls. Plant Street maintains an old town feel with historic old brick buildings and a newly built public gathering place in the street's central median. I arrived a bit early but Dan Rafkin and the band had already set up and were ready to start their first set. The band was called Riff Raff. They sang old country cover tunes from musicians like Merl Haggard. I never got to hear any of Dan's original material. This wasn't what I expected but the crow ate it up. Larry, His wife and daughter and her son showed up and they hunted for a restaurant to eat supper. There were lines and an hour wait wherever they went. Before they got back, I finished my sketch and headed home.